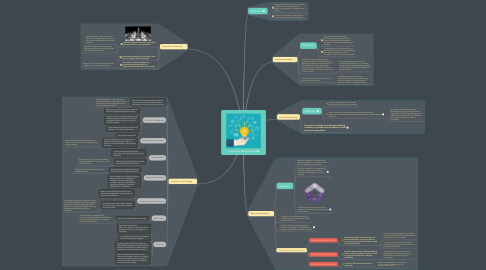 This is structured mind map on the topic innovation management, definition of business innovation and examples of innovative technologies. It also gives advice on innovation strategy and innovative leadership. 1.2. Process innovation happens when an organization solves an existing problem or performs an existing business process in a radically different way that generates something highly beneficial to those who perform the process, those who rely on the process or both. 1.3.1. Including employees or the actual organization itself, or it can create value to external customers, including business partners, end users or actual consumers. 2.1.2. A plan made by an organization to encourage advancements in technology or services, usually by investing in research and development activities. 2.1.2.1. For example, an innovation strategy developed by a high technology business might entail the use of new management or production procedures and the invention of technology not previously used by competitors. 3.1. Leadership plays an important part in how innovation occurs in an organization. 3.1.1. Leadership doesn't only come from upper-level management; it also comes from lower-level managers and all team members. 3.1.2. An effective leader is able to work with different people and mentor them so that they can achieve their goals. 3.2. Innovation leadership will trickle down from those in charge to other employees. 3.3. The manner in which messages are communicated to employees can significantly affect the success of a project. 3.3.1. Motivation is also important because of its impact on how some employees work. 4.1.2. Business innovation is an organization's process for introducing new ideas, workflows, methodologies, services or products. 4.2. The goal is to reinvigorate a business, creating new value and boosting growth and/or productivity. 4.3. It should improve on existing products, services or processes; or it should solve a problem; or it should reach new customers. 4.4.1.1. If increasing profits is the main driver for business innovation, many organisations may choose to change their revenue model as a first port-of-call. 4.4.1.1.1. This can involve re-assessing the products or services offered or taking another look at the company’s pricing strategy. 4.4.1.1.2. Innovation does not have to be radical, sometimes changing even one element can yield significant results. 4.4.2.1. Requires organisations to identify which of their processes, products or services could be improved to boost the company’s profitability. 4.4.2.1.1. Innovation in this case could refer to forming new partnerships, outsourcing specific tasks or implementing new technologies. 4.4.3.1.1. Ambitious organisations can choose to change industry completely for the purposes of innovation. 5.3.2.1. Applications could range from marketing, VR, rich content, up to a re-designed airport security strategy. 5.5.1.1. Typical examples are Microsoft HoloLens and Google Glass. 5.7.1.1. Its distributed, decentralized and immutable properties make it the ideal way to store and track data across numerous domains and use cases. 5.8.1. Regardless the particular class — humanoids, nano-robots, military, industrial, and so on — the progress is impressive. 5.8.4. In the near future we will start to meet Robots with proactive behaviors, advanced context understanding, able to adapt to human sentiment, enforce ‘personalities’ and communication styles.